UDM Downloads > Advanced Outlook Repair! 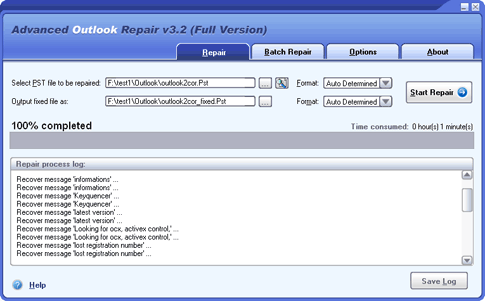 Advanced Outlook Repair is the best Microsoft Outlook recovery tool. It uses advanced technologies to scan the corrupt or damaged personal folder files(.pst) and recover your mail messages and all other items as much as possible, so to minimize the loss in file corruption. Main Features: 1. Support Outlook 97, 98, 2000, 2002, 2003, 2007 and 2010. 2. Support to recover mail messages, folders, posts, appointments, meeting requests, contacts, distribution lists, tasks, task requests, journals and notes in PST files. All properties, such as subject, to, from, cc, bcc, date, etc., are recovered. 3. Support to recover mail messages in plain text, RTF and HTML format. 4. Support to recover attachments, including the documents and images attached to messages and embedded in HTML bodies. 5. Support to recover embedded objects, such as another message, Excel Worksheets, Word documents, etc. 6. Support to recover deleted Outlook items, including mail messages, folders, posts, appointments, meeting requests, contacts, distribution lists, tasks, task requests, journals and notes. 7. Support to recover oversized 2GB PST files. 8. Support to split the output PST file into several small files. 9. Support to recover password protected PST files, both compressible encryption and high encryption(or best encryption) are supported. 10. Support to convert PST files from Outlook 97-2002 format into Outlook 2003-2010 format, and vice versa. 11. Support to repair PST files on corrupted medias, such as floppy disks, Zip disks, CDROMs, etc. 12. Support to repair a batch of PST files. 13. Support to find and select the PST files to be repaired on the local computer, according to some search criteria. 14. Support integration with Windows Explorer, so you can repair an Outlook PST file with the context menu of Windows Explorer easily. 15. Support drag & drop operation. 16. Support command line parameters.